Nov 15, 2018: The Tata Ace Zip XL is a slightly bigger and better version of the standard Zip. It has a day cabin and measures 3,369 mm in length (1,650 mm wheelbase) and is 1,480 mm wide. It has a gross vehicle weight of 1,310 kilograms and a maximum payload capacity of 600 kilograms. The axle suspension is done by MacPherson Strut for the front and Coil Spring for the rear. Hydraulic drum braking system is given for all the wheels, along with parking brakes. Under the hood, it is driven by a 611 cc naturally-aspirated single-cylinder engine with water cooling. The motor can produce a maximum power of 12.47 bhp at 3,000 rpm while putting out a maximum torque of 38 Nm at just 1,200 rpm. A 4-speed manual gearbox is mated to the engine with a single-plate dry clutch. A 10-litre fuel tank is offered. The Tata Ace Zip was first launched in 2010 and has seen more than 1 lakh units being sold in the Indian market. This urban goods mover was launched to compete with the ubiquitous three-wheeler, by offering better safety and stability. Capitalising on the success of its smaller variant, the Tata Ace Zip XL comes with a 15% longer body, more power, torque, gradeability and better turning radius. Add to that a superb warranty program and 1600 service touch points of the Indian manufacturer and this vehicle becomes a winner straight off the bat. 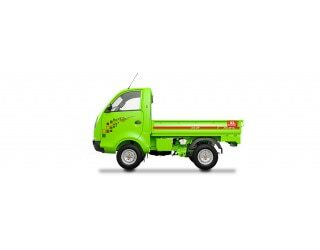 The Tata Ace Zip XL's competition are the Mahindra Jeeto, and Piaggio Porte. The single cylinder 611cc mill is water-cooled and produces a healthy 12.47 hp at 3000 rpm. More importantly, it produces 38 Nm of torque at just 1200 rpm, giving the Zip XL good pulling power even when fully loaded. The engine is mated to a manual synchromesh 4-speed gearbox. This is a simple yet effective solution for the requirements in this class. This solid torque figure show up in the Tata Ace Zip XL's 22% gradeability. This makes it perfect for urban environments where goods have to be moved through narrow but steep routes. The 10-litre fuel tank capacity coupled with the 33.8 kmpl ARAI fuel efficiency figures give the Zip XL a decent tank range. Allowing for longer continuous cargo runs without the need for refueling. The Gross Vehicle Weight is 1310 kg, while the kerb weight is 710 kg. Ground Clearance is a useful 150 mm. The vehicle build is typically reliable, as one would expect from Tata. At the same time weight has been kept low, to maximize the payload. The sturdy Ace Zip XL's payload is 600 kg in its ample carriage area. The area of which is 1927 mm long, 1480 mm wide and 300 mm high. The Tata Ace Zip XL handles well as it is equipped with a Macpherson Strut suspension at the front and a coil spring with semi-trailing arm and hydraulic shock absorbers at the rear. The suspension gives enough damping to provide a plush ride. While still being stiff enough to handle the 600 kg payload easily without bottoming out. Essential for the broken urban roads where this vehicle will spend the majority of its life. Making it even more apt for the cities is its 3.5 m turning radius. This allows the Zip XL to be maneuvered in incredibly tight spots. The 12-inch wheels which have been employed on it complement the suspension by rolling over small obstacles and absorbing potholes. Hydraulic drum brakes have been used for the front and rear on the Ace Zip XL. It would have been good if discs had been provided at least in the front to increase stopping power. The lack of it is mostly to keep the cost down in this highly price sensitive segment. It does get Twin Load Sensing Proportioning Valve brakes instead. This system senses the load on the rear wheels and regulates the braking input accordingly. Thanks to this the rear wheels do not lock up when being driven unloaded. The 1650 mm wheelbase gives the Zip XL added straight-line stability without compromising its handling. This helps especially when the vehicle is being driven at maximum load capacity. The driver and passenger are kept safe thanks to seat belts, powerful headlights for night driving and a large windscreen for better visibility in tight traffic situations. There is a high tensile beam at the front to protect the driver in case of a frontal collision. Tata offers the Ace Zip XL with a 2 year or 72000 km warranty which is one of the best in this segment of goods carriers. The XL gets the immediately recognizable Ace Zip series design. Even though it is a vehicle built for practicality, one cannot help but notice how 'cute' this vehicle looks from the front. The driver gets the comfort of having an adjustable seat for spending long hours in the vehicle. There is also a factory fitted music system which can be added to the Zip XL. The load body is bolted onto the XL, which makes servicing it substantially easier.